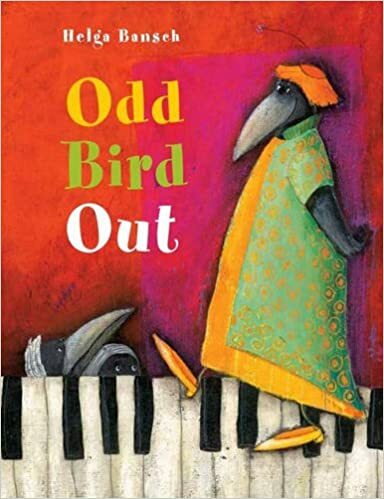 Written and illustrated by Helga Bansch, Odd Bird Out is the story of a flamboyant raven named Robert. Bansch introduces a fabulously queer character who finds himself by leaving his repressive nest. Although not widely available, Bansch’s raucous picture book is worth the hunt! Most of the ravens in the community are subdued, but not the high-heel wearing Robert who enjoys nothing more than being the center of attention. He dances, sings, and tells jokes to an ungrateful audience any chance he gets. The community eventually has enough of Robert’s excessive behavior and demands he leave. Robert’s exile is met with little resistance, although some tears, from his family. The forced departure ends up being the push Robert needs to create a chosen family appreciative of his campiness. In one of Bansch’s lively illustrations Robert is shown performing for a large group of birds who can’t take their eyes off him. In an interesting turn of events, Robert returns home under the stage name Bobby Raver. This time, far from rejecting the queer raven, his old community appropriates his style. They “dress-up for his concerts in the most outrageous, outlandish plumage.” Here, Bansch takes the opportunity to slip in a sly aside about cultural appropriation. Most children’s books provide clear, uncomplicated resolutions, happy endings that are easy to identify. But, it’s necessary to represent familial and community rejection, a reality for many queer children. Bansch doesn’t shy away from difficult situations, in fact she finds queer possibility in them. Bansch delivers sophisticated fair, but it is not too mature for a young audience. The story she weaves is a critical edition to the canon of LGBTQ* children’s books. Odd Bird Out has an interesting ending, which is, perhaps, even better than a happy one.